Andrew Freedman claims that Chesapeake Bay freezing (like it did in January) is becoming extremely rare due to global warming. The first week of January was the coldest such week on record in most locations in the Eastern United States. It was so frigid that week, and the week preceding it, that sea ice formed around Cape Cod and Chesapeake Bay, sharks froze to death on Massachusetts beaches, and alligators went into a resting state while entombed in ice. 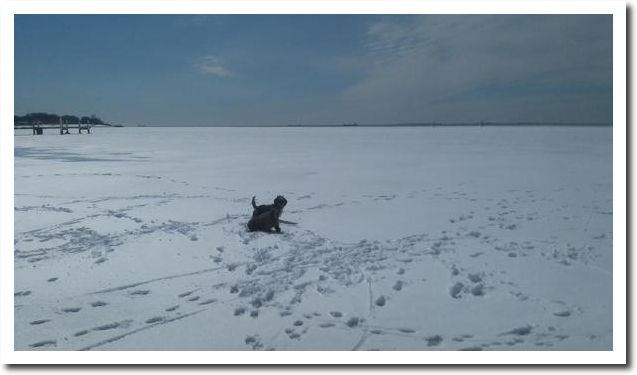 I took the dogs for a walk on frozen Chesapeake Bay on March 7, 2015. Probably the first time that has happened in March since the 18th century. The only thing that is becoming extremely rare is any integrity or accuracy in climate science. And here is another Andrew who claims to be a scientist, citing Andrew Freedman’s junk science as evidence. or the use of chemical weapons by Assad recently. and the experts/journalists will confirm it by crying out loud. they will go in full ignorance and denial about it until people stop talking about it. noone will ever try to held them accountable. as the international court of justice is just a god&pony PR show for some small country villains who tried to resist the US deep state agenda to create an illusion justice for the Griffs. Andrew Newton found overwhelming evidence that as a result of global warming cold snaps have became either more common or exceedingly rare. 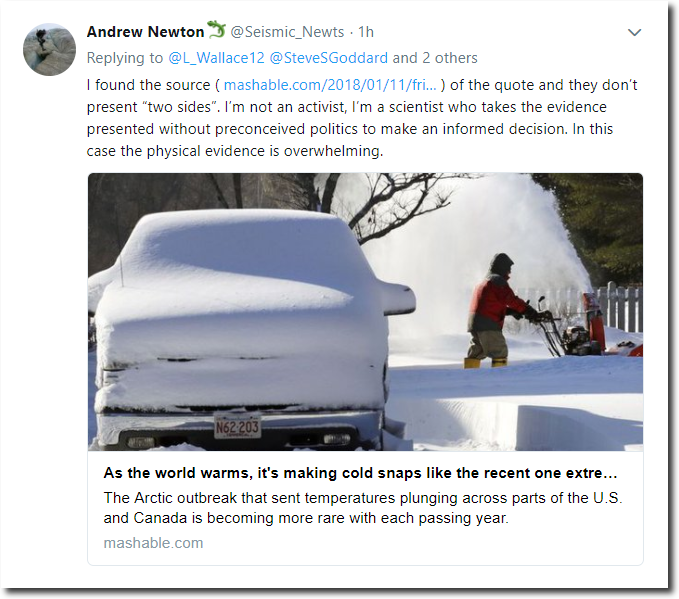 Looking at the tweet exchange he was talking about the overwhelming evidence for what weather that caused the cold snap (ie cold arctic air going south) not the article. The ref to the article was trying to find someone else’s source. Very odd to criticize for something that actually wasn’t said. 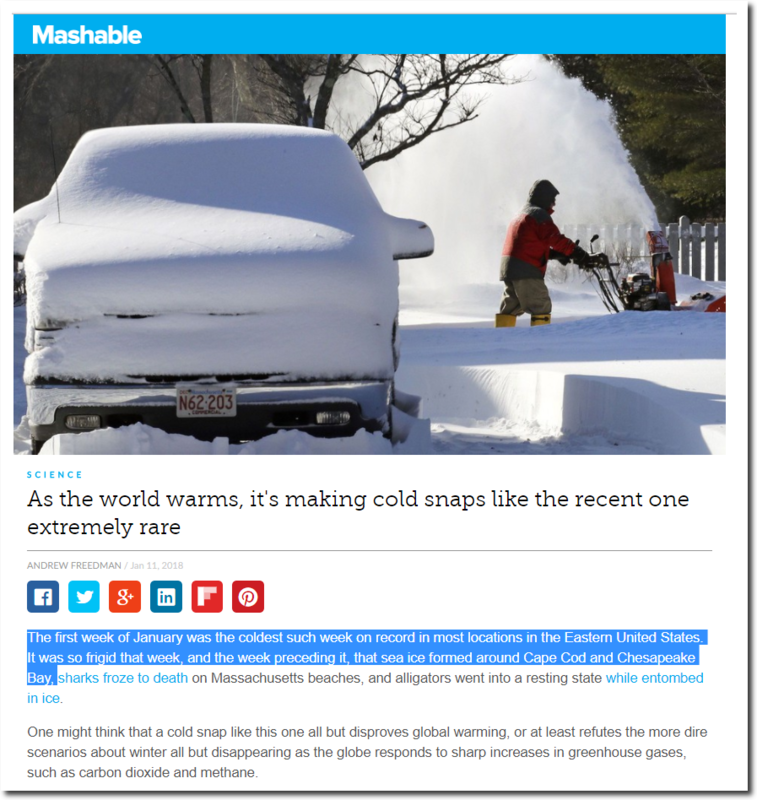 The article blames CO2 for making Winters warmer. There is zero overwhelming evidence of this. The fact that we escaped the grips of the LIA is what is making Winters warmer. The only overwhelming evidence is that of fraud by climate alarmists. Yep new here, only discovered the site on Sunday. Lots of interesting opinion articles on the site. Well I am no alarmist, but the way I see it is that there is plenty of ambiguity with climate data. Some (only some) data do suggest some link with CO2, depending on the statistical technique. Whilst many, such as on this site, show the link is more tedious. I just worry when the first response from high profile figures is to abuse the scientist rather than challenge the interpretation. “He is stupid and doesn’t understand climate” is not a robust argument – that goes for the alarmists too. I doubt they are stupid, they just believe one interpretation fits the data better than others. Much better to present the counter arguments for why they are wrong. Name calling and abuse must surely undermine the great work like Steve’s? It has been a record cold April so far over much of the US with temperatures in Rochester, MN averaging a mind boggling -17.5 degrees below normal through April 20th . Also April monthly snowfall records have already fallen by a wide margin in places like Minneapolis, Green Bay and Sioux Falls. This particular Andrew does not believe that a record cold, snowy April is a scientific indicator of catastrophic global warning. Only a complete idiot or someone worried about losing their grant money would make such an irrational assumption. yes it has: due to the change in the arctic where it has at times been exceptionally warm. Do you still read the Gruniad, griff. No wonder you HAVEN’T GOT A CLUE. !!! Ice & snow covered about 85% of the land mass visible and 100% of N. America, as of MID April 2018! Ice also FILLS the Artic Ocean basin, plus Baffin Bay. The extent of the snow & ice cover in mid April suggests frigid temperatures for much, and perhaps all of, winter 2017/2018. Bit harsh to call the guy an idiot when he was merely explaining the cause of the weather – cold Arctic air descending. Alarmists don’t need ammo, they have fake crises, and these they use to kill millions. They don’t, you are right! But why give them more? I know I am more inclined to listen to someone else’s views if they are cordial. I definitely won’t listen to them if they start with insults. 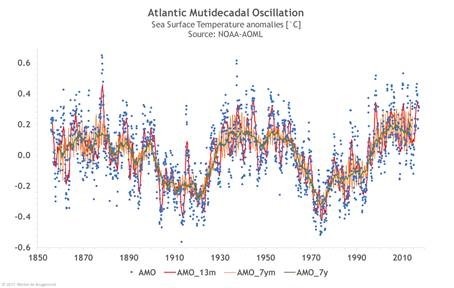 to convince the crazy AGW deniers that they started to bloom too early in 2018. ….I thought they were supposed to be growing bananas by now? As the world cools, climate fraud is becoming extremely obvious. I was confronted by a petition huckster in a shopping mall yesterday shilling to bring a law to a vote to commit Arizona to 50% renewable by 2030 or some such nonsense. I shoved the clipboard back at her saying, ” I totally disagree with this!”. Rude of me I suppose. There isn’t a single temp series showing the world is cooling, is there? and the sea ice hasn’t ‘recovered’ has it? griff wants to world back in the ANOMALOUS COLD of the LIA. You are a IGNORANT FOOL and an IDIOT griff. It’s all part of her plan to kill off the poor. What evidence is there that griff is a ‘her’? What evidence is there that Griff is a he? There is no evidence that griff is a boy but she could be a wooden puppet. If you look at unadjust rural weather stations you will find the cooling. Our so called climate scientist just adjust them up since it destroy their climate warming scam. So called climate scientist would know UHI if it bit them in the posterior. To be fair although the original article is trash, I looked at the guy’s tweet and he doesn’t offer support for the article, he was trying to find somebody else’s quote. Seems unreasonable to criticize him for trying to find the source of other people’s statements. The tweet exchange was quite clear that he was pushing the “Polar Vortex caused by warming” BS. In the 1970’s climate scientists blamed the same polar vortex behavior on global cooling. The evidence is overwhelming that he doesn’t know what he is talking about. Fair point, Tony. Though I guess he was partly right in that the vortex is associated with the cold snap. It is just he was very wrong with the link between the vortex history and CO2. As I said above on another thread, I just worry when the response is to say things like “he doesn’t know what he is talking about”. Why the need for such aggressive terminology and prose? If your wishes are similar to mine and that CO2 is not used as part of public policy, isn’t it better to embarrass them with facts rather than throw insulting statements (though I know they go both ways)? Wouldn’t that be a more effective? Let them be the ones who get angry, embarrass themselves and reveal they are all wearing tin hats! Great site by the way, I have only just discovered it! I plan on popping in more regularly! I get the impression that a polar vortex could be caused by a change in the cycle. and now, as warming is starting to change to cooling. Do we know if there was a polar vortex around 1920 or 1870?